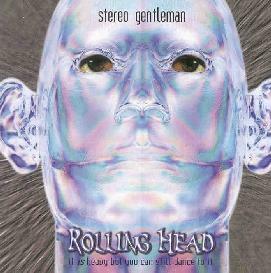 Stereo Gentleman - "Rolling Head"
This is a solo music project by Peter Petchalov. It is basically electronic music composed completely on a MacIntosh computer but supplemented with some heavy guitar riffing and a lot of guitar soloing, or perhaps I should turn that around and say it is a lot of guitar supplemented with computer drums, bass and synthesizer. This guy loves to play the guitar and he does it well. He seems to overuse the same sort of speed metal riffing before entering into his guitar soloing on nearly all the tracks. I enjoyed some of this quite a lot but for me this type of guitar driven instrumental music can never be done as good by one as by a group of real musicians (especially dynamic drumming - this just can't be done in the rock setting electronically very well). This project could be greatly enhanced if Peter would experiment with more guitar sounds and effects when soloing to add a greater variety of sounds. This will appeal the most to those who like the instrumental guitar rock released on Mike Varney's label. For more information you can visit the Stereo Gentleman web site at: http://www.stereogentleman.com.